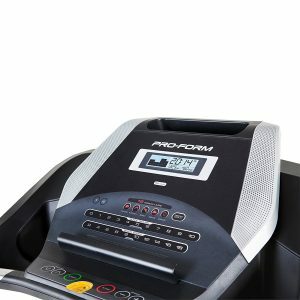 Proform has a great reputation when it comes to manufacturing fitness machines. That’s why a lot is expected with the release of the Proform Endurance M7 Treadmill, and it certainly did not disappoint. 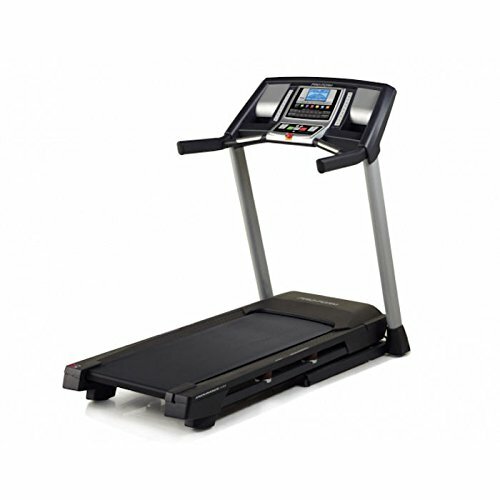 It falls under the lower mid-price range treadmills, yet its features are comparable with more expensive models. With its ProShox cushioning technology and a full entertainment system, you will surely have a productive workout every time. Keep on reading to get a more detailed look at the Proform Endurance M7 Treadmill! With a maximum user weight of 125kg, the Proform Endurance M7 treadmill is undoubtedly sturdy. Its 2.5CHP (3.0 HP Peak) Mach Z motor is responsible for making it go as fast as 0-18kph (0-11.1mph). This motor power is relatively high for its price range because treadmills that are offered at a low mid-price range typically have 2.0CHP motors. You can also adjust its incline levels from 0 to 10% to add a bit of challenge to your workout. If you’re one of those people that prefer to listen to loud music while pumping up your heart, you will be glad to hear that the Proform Endurance M7 treadmill has a complete sound system. And by complete, I mean it has Intermix Acoustics 2.0 speakers that are compatible with your iPod or MP3 player. This means you don’t have to wear headsets that sometimes get in the way whilst running. The sound system is embedded around the console, along with the control buttons which you use to select from the 19 workout programs available. Once you feel your heart pumping up, you can monitor your heart rate with the hand pulse grips or the wireless receiver (chest strap sold separately). 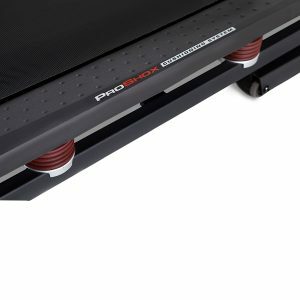 You will love running indoors when you step on the ProShox Cushioning technology integrated on the Proform Endurance M7 treadmill. Its soft feel lessens the pressure on your joints when walking or running so it wouldn’t leave any strain on legs or feet. This technology, along with a full running area with a size of 51cm x 140cm, will always make you look forward to using your treadmill. 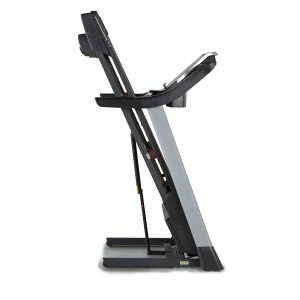 The Proform Endurance M7 treadmill can be too heavy for some, but it’s nothing to worry about because it has an EasyLift Assist which gently drops and folds the equipment. This won’t only prevent the treadmill from being broken, but it also helps you quickly keep it out of sight when you have some visitors coming in. It also has built-in transport wheels so you can easily drag it to the storage room when needed. Because the treadmill can be heavy because of the motor, it would require at least two people to get it fully assembled. However, the instructions provided are clear, and the parts are carefully labelled so it wouldn’t be very difficult to get it done. The JLL T350 Digital Folding Treadmill is one falls under the upper budget-friendly price range, yet it has advanced features that can be compared with more expensive models. First, its console is touch sensitive, so you can just tap on the button, and it will already do the job. It has speed ranges from 0.3 km/h to 18 km/h, 20 incline levels, and 20 running programs. This treadmill also has built-in high-powered speakers, but the catch is that you don’t need to connect it to an AUX input because it’s Bluetooth enabled! It also has a USB port where you can play music or charge your phone while it’s connected to its Bluetooth speakers. JLL T350 Digital Folding Treadmill Detailed Review? CLICK HERE. 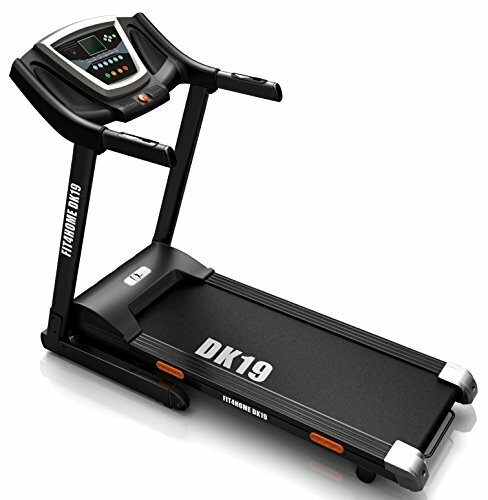 Because I want to give you more affordable choice, I also want to share with you this DK-19 F4H Auto Incline Treadmill. It has a 1.75HP motor which is already suitable for fast-paced running, jogging or walking. This treadmill is integrated with a 6-level shock absorption system, and it already comes with pulse sensors. However, since its a budget-friendly treadmill, its incline levels are adjusted manually, so you have to step out of the treadmill to make it go up to 5% incline. Nonetheless, is still an excellent choice and it comes with a sound system that with plug and play USB input. Also, it comes to you with the majority of the parts pre-assembled, so you are left with minimal work to do. If you have limited space at home, but you want a quality treadmill, the JTX Slim-Line Treadmill will be an excellent option for you. It boasts as the most compact home treadmill available on the market, and it’s flat-folding, which allows you to store the treadmill in even the smallest of spaces. Its running deck measures 125cm x 41cm, and it’s integrated with an 8-point shock suspension system. With a maximum user weight of 110kg, expect this machine to be relatively heavy, but you don’t have to worry about setting it up because it arrives at your house 100% assembled! Plus, it comes with free hand weights which will help you work out your upper body and tone your arms while you walk or run, and as a result, you’ll get a full body workout. 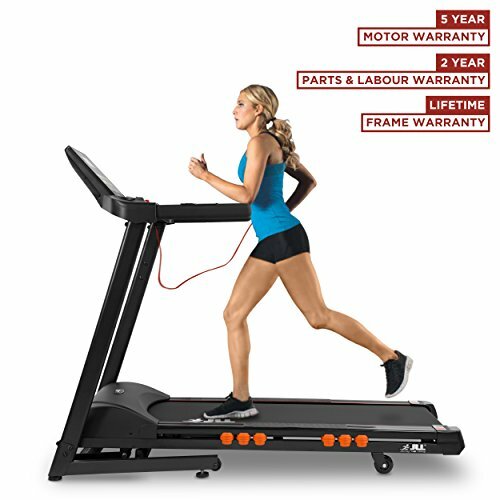 This treadmill is packed with a lot of features, and it has a powerful motor which can last a lifetime. The Branx Fitness ‘Cardio Pro’ Touchscreen Console Treadmill is driven by a powerful 6HP Peak motor (3.5 CHP Motor) that ensures the product will last long even after enduring continuous heavy use. It’s almost a commercial-grade quality, and it comes with 99 workout programs so you’ll never get bored with every session. It also boasts a 7-inch touchscreen console which straightforward and easy to use even for beginners. 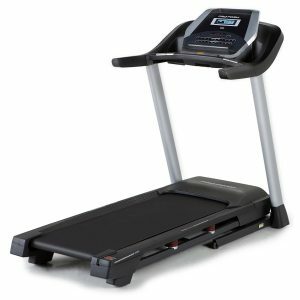 It’s a high-end treadmill, but it’s currently on sale at 50% off (at the time of writing), so you should immediately grab the deal! Branx Fitness ‘Cardio Pro’ Touchscreen Console Treadmill Detailed Review? CLICK HERE. 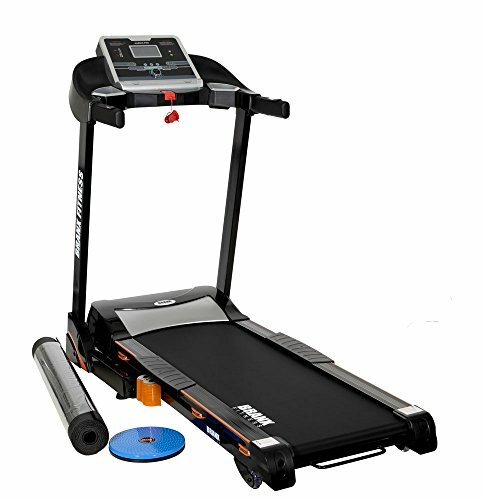 Overall, with all the features of Proform Endurance M7 Treadmill, it’s definitely reasonable for its price. It’s not too expensive, yet it’s also not too affordable because it has a durable quality. 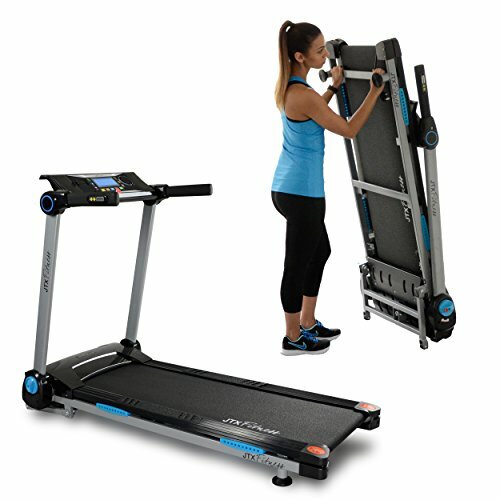 This treadmill has a 2.5CHP (3.0 HP Peak) which is impressively higher than other models within its price range, and its comfortable running deck has ProShox Cushioning technology. Whether you’re a beginner, intermediate or a pro, this treadmill is a cost-efficient way to get a regular cardio workout.